Mahākāla is a Sanskrit word meaning of mahā (महत्; “great”) and kāla (काल; “time/death”), which means “beyond time” or death. The literal Tibetan translation is “Nagpo Chenpo” (Tibetan: ནག་པོ་ཆེན་པོ།), although when referring to this deity, Tibetans usually use the word Gönpo (Tibetan: མགོན་པོ།). Typically Mahakala is black in color and with a crown of five skulls, but there are many variations in the objects he holds, number of arms and other features. He is a wrathful deity who protects, a dharmapala or “defenders of the law”. He is often depicted on phurbas (ritual symbolic daggers) for this reason. Would Mahakala be full of wrath to know that his faithful followers things were being sold by the very people (the Chinese Communists) who had tried to suppress their beliefs this entire time? I think his expression is extremely appropriate as well as timely. This same deity(?) is also frequently referred to as Vajrapani. 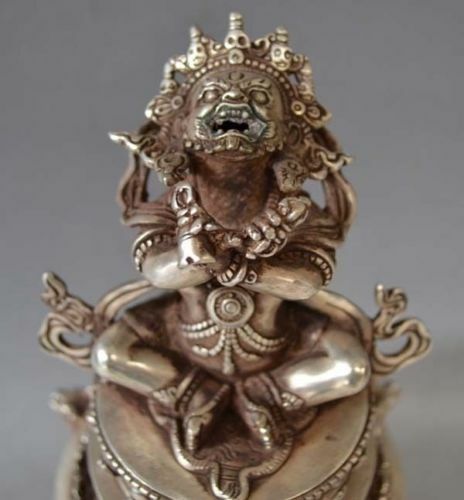 Vajrapani is a compound word in Sanskrit in which ‘Vajra’ means “thunderbolt or diamond” and ‘pani’ means “in the hand”. He is one of the earliest-appearing bodhisattvas in Mahayana Buddhism, and is the protector and guide of Gautama Buddha, and rose to symbolize the Buddha’s power. This deity is also called Chana Dorje, but less frequently. See this auction: no auction when checked back on it 04/25/2016 by zzqtk , apparently this seller took people’s money and ran. Comments on their feedback: “Two months have passed!!! Gave bogus tracking number, asked to wait.” “ANOTHER SCAMMER. PACKED UP and RUN WITH MORE THAN 10,000 auction items” I had actually bought items from this same seller myself over 1/2 a year ago, who did really deliver the goods to me- however the jade came to me with gravel in the cracks of it, so I left them bad feedback “The gravel in the cracks leaves no doubt where this came from- the grave!”. After this they banned me from purchasing from them again. The stone matches stone that other dealers are also selling which I believe came from the same tombs. So I believe this was either a government lackey who got tired of their job, or a government lackey who was doing their job in eroding buyer confidence. It is easy enough to just go on selling the same goods with a different name, and probably this isn’t the only shop these people had to begin with. At the time that they banned me for leaving truthful feedback, several other antique shops also banned me who carried similar goods. The Mahakala mask above is yet another example of an item that is taken directly from someone’s grave. Repeatedly. Notice the huge quantity of rudraksha prayer beads right beside this huge sacred dagger. I really don’t think anyone would have sold the Chinese either and that these sacred items are being sold by the very people who’ve persecuted and oppressed religion. 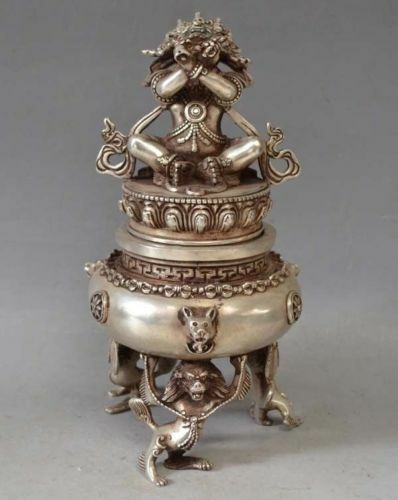 It appears from the photographs above that the exact same religious artifact, a Mahakala phurba that is over 6 ft tall, is being sold by the same person who has two different shops. Often times Chinese sellers do this which not only provides them with more opportunities to sell the items, but it makes appear that there is competition and a free market when there really are very, very few sellers who often sell enormous volumes in multiple shops. The seller also appears to be very Chinese while all of their goods are Tibetan items and their shops are also located in Beijing, not Tibet. The other red flag besides such a huge volume of Tibetan goods being sold exclusively by Chinese, not Tibetans nor even being shipped from Tibet is the fact there appears to be very few Chinese antiques that the Chinese sellers are selling along with so many Tibetan goods. If they are all Chinese and located in China, wouldn’t they also sell their own antiques? But mainly it seems to be underpriced and undervalued religious items that don’t even belong to them and probably have very little market for them in mainland China since they are Tibetan goods. The Chinese Communist Party officially has advocated taking from the rich and redistributing the wealth to “the people” but here we see that many have been robbed, while very few individuals with multiple accounts are benefiting from the spoils of over 1/2 century of looting the so-called “rich”.